KeyboardPartner HX3 Module Mark 5 with the new 3.5 engine. If you own a Drawbar Clone Keyboard, MIDI Controller or MIDI keyboard and you want the best drawbar clone sound, you have found it. 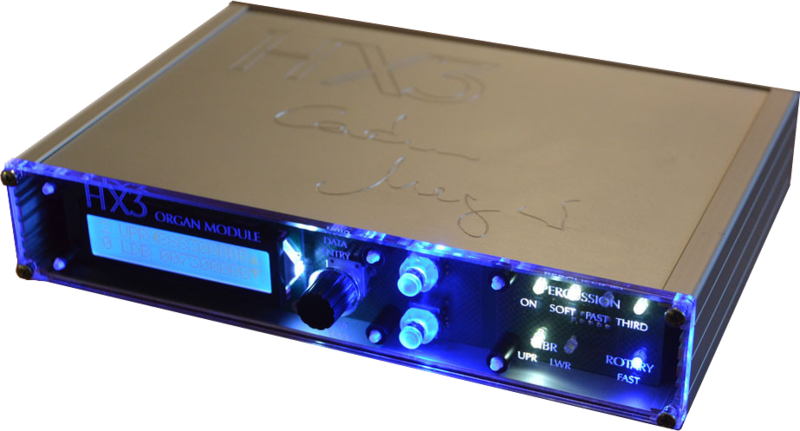 The HX-3 Organ Module has a myriad of different advanced features. These advanced features allow you can create just about any nuance to get the tonewheel sound that you're seeking. Full polyhony, 91 standard tonewheel generator and then new Extended 96 tonewheel generator. If you really want to get deep into the heart of the sound, use the free Windows based Remote Software to even adjust details like the tapers of the drawbars. 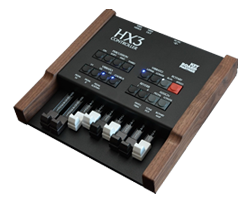 The HX3 is a tonewheel organ in a small box! Controlled completely via MIDI, selectable CC-Sets for NI B4, Hammond, Hamichord and other. 30 presets (to be stored locally), many "secret" HX3 parameters tweakable by menu with incremental encoder. And, of course, the legendary HX3 sound. Also available as a kit for installation in "dead" Hammond XB-2 and as bare boards for installation in other organs/instruments by skilled technician. Extremely low internal latency of 50 microseconds Key-to-Audio. However, MIDI transmission delay is about 1 ms per note played. Menu entry count depends on selected basic organ model (default: B3). 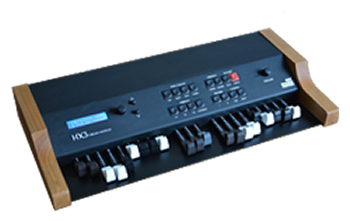 Other organs (H100, Böhm/Wersi, Versatile Electronic Gating, Conn Single Note Generator, CheesyCombo) are available with extended licence only. Navigate to Organ Model in the menu to alter the basic organ model. On B3 and Combo organ models, mixture drawbars are not active. Percussion – will step through available percussion combinations of NORM/SOFT, FAST/SLOW, 2nd/3rd (8 options) plus OFF. Available for B3 organ model only. UpperDB Mix1 to UpperDB Mix3 – mixture drawbar settings for upper manual. Mixtures consist of up to 3 higher harmonics in individual levels. Please note: As opposed to the original H100, HX3.5 provides three mixtures instead of two. H100 2ndVoice – selected percussion harmonics will not decay. As on H100, all percussion voices are bypassing the vibrato circuit. If drawbar voices are on vibrato and 2nd Voice is active, this will yield a nice chorus effect. Perc/EG Mask – selects harmonics to enter the percussion/2nd Voice circuit. Each “o” symbol represents a single harmonic from 16’ to Mixture 3. An underscore indicates the harmonic to be changed. If activated, the “o” symbol is filled white. LowerDB Mix1 to LowerDB Mix3 – (non-B3 organs only) mixture drawbar settings for lower manual. Mixtures consist of up to 3 higher harmonics in individual levels. Please note: As opposed to the original H100, HX3.5 provides three mixtures instead of one. Pedal drawbars including ADSR setting are saved as pedal voice. Pedal Attack – changes pedal ADSR envelope attack time. ToneTrimPot – mimics TONE pot on simulated AO28 amp; well, a little bit more on high values. TubeAmp Insrt – activates 122 amp simulation, otherwise amp is bypassed. TubeAmp Gain has no effect if off. SpkrSim Insrt – activates rotary cabinet simulation, otherwise horn/rotor simulation is bypassed (recommended for use of external rotary cabinet). Reverb Prgm – selects one of 3 different reverb programs. For each program, amount of reverb may be adjusted. Transpose – allows transposition by up to +24 or -24 half note steps. Notes beyond 5 octave limits of console organ will not produce any sound due to accuracy of physical model. Split Manual – switches split mode on or off. Split Point – sets split point (when split is on) as key number (24 is second „C“ on manual). Split Mode – default split setting on power-up, engaged when split set to ON. TG Flutter – adjusts tone generator "sloppyness" (spring clutch tension, bearing precision). no foldback ("all way down") with muted level. Along with ToneTrimPot (see above), adjusts behaviour and response of the emulated AO28 preamp chassis and transformer/tube saturation. SwellTrimCap – adjusts organ output volume like the trim cap in B3 swell pedal control. Higher values add more punch and output transformer saturation effects. Minimal Swell – adjusts minimal organ output in swell pedal heel position. AO28 TubeAge – controls emulated AO28 preamp tube aging (higher triode distortion k2 in 12BH7 output stage). MIDI Channel – sets MIDI base receive channel 1 to 10 (upper manual, lower manual is on +1, pedals on +2). Custom CC (not implemented yet). MIDI Swell CC – sets accepted swell/expression CC number (default #11). MIDI VolumeCC – sets accepted overall volume CC number (default #7). Detailed modelling of scanner vibrato features a lot of adjustable parameters. Avoid randomly changing parameters; they are intended for real organ enthusiasts – you should know what you’re doing. Scanner Gears – adjusts scanner drive gear and thereby vibrato frequency. Scanner Leak – adjusts leakage of higher notes in scanner compartment due to parasitic capacitances. VibCh ModFac – adjusts amplitude modulation caused by delay line on all vibrato/chorus knob settings. VibCh PreEmph – adjusts treble increase when vibrato/chorus is switched on. Effect on chorus is obvious, while increase on Vibrato is more subtile. VibCh Reflect – sets amount of reflected signal on LC linebox due to aged caps. Higher values lead to a ‚celeste’-like effect as found on model M100. VibCh Respons – sets upper frequency response of LC linebox. Ch LineboxLvl – adjusts ‚wet’ modulated amount when in chorus mode. Ch BypassLvl – adjusts ‚dry’ unmodulated amount when in chours mode. PercNormLvl – adjusts percussion level in PERC ON, NORMAL tab setting. PercSoftLvl – adjusts percussion level in PERC ON, SOFT tab setting. PercLongTm – adjusts percussion decay rate in PERC ON, SLOW tab setting (higher value = faster). PercShortTm – adjusts percussion decay rate in PERC ON, FAST tab setting (higher value = faster). PercMuteDB – sets drawbar muting amount while in Perc NORM. No mute will happen if value set to 125. PercPrecharge – sets percussion circuit recovery time; if set to lower values, staccato notes yield muted percussion. HornRampUp – Rotary simulation horn acceleration from SLOW to FAST. RotorRampUp – Rotary simulation rotor acceleration from SLOW to FAST. HornRampDown – Rotary simulation horn brake time from FAST to SLOW. RotorRampDown – Rotary simulation rotor brake time from FAST to SLOW. Rotary Spread – Rotary simulation stereo spread (width). Rotary Balnce – Rotary simulation volume balance horn/rotor. 1 LED Rotary Simulation for speed. Shows flashes fast, slow or off when stopped. The DBc Drawbar Controller is the perfect accompaniment to HX3 Organ Module. If you have played a vintage tonewheel organ, you know how much more expressive you can be when playing one. Connecting the DBc to the HX3 Organ Module lets you have that freedom. All without mapping anything. Just plug it into to the HX3 Organ Module via MIDI and you're ready to go. Button Ergonomics: All of the buttons on the HX3 Drawbar Controller are big enough for your fingers, unlike other products with tiny buttons, that are hard to see, let alone press. Maybe you have an older digital clone Drawbar Organ that won't let you control the HX3 Organ Module. This is just one idea that allows you to have the HX3 sound and Drawbar Organ experience with the ability and ease of connecting, via MIDI. Plus, you have everything you need to connect to just about every audio configuration via 1/4in outputs and even a standard 11pin connector to plug right into most of the new 11pin rotary speaker cabinets or interface kits. Button Ergonomics: All of the buttons on the HX3 Drawbar Expander are big enough for your fingers. They are all grouped together correctly and have blue LED's to indicate when a feature is active, which is an important visual cue when performing. The New HX-3 3.5 Engine has a myriad of different advanced features. These advanced features allow you can create just about any nuance to get the tonewheel sound that you're seeking. Upper and Lower Vibrato/Chorus* - V1/C1, V2/C2 & V3/C3. Percussion* - On/Off, Normal/Soft, Fast/Slow, 2nd/3rd - settings can be saved to presets. The 11pin connector allows you to use the following Leslie speaker models and connector kits. 1197 Kit - Any Leslie Speaker with a 9 pin Connector. Disclaimer - Leslie and Leslie Speaker are Trademarks of Suzuki Musical Instruments, LTD of Japan. All TRADE-UPS Require you to either send you HX3 Module, DB-e or the Boards from the units. We will test them and then ship the UPGRADE back to you. Shipping for Modules and Boards is a flat fee of $10.00. DB-e is $25.00.